I’m wrapping up our final days at Disney World today! We spent the last two days at the Magic Kingdom. If you’re doing a trip, I would highly recommend at least 2 days at Magic Kingdom…there is so, so much to do. Do three if you can – we were able to spend three whole days (plus one night) there and didn’t come close to running out of things to do! If you remember from my last post, the previous night had been a very, very late one…so we were all kind of dragging this morning. And by all I mean Noah and me…Emmie was ready to go! Tinkerbell brought her a princess dress for the day (I’ll talk a little bit more about her Tinkerbell prizes in my Q&A Post next week). We had early reservations at The Crystal Palace in Magic Kingdom for breakfast. The bus was also kind of crazy this morning, so we barely made our reservation time. We waited for a few minutes by the pretty duck pond outside for our table. The Crystal Palace is another breakfast buffet character meal, and we really enjoyed it. The view is great and the food is just your classic breakfast buffet food, but was very good. Plus, we got the meet all of the friends from Winnie the Pooh. I’m not a big fan of buffet food pictures (because they always look kind of gross), but this breakfast had a few stand-outs. The breakfast lasagna was awesome (kind of a sweet layered dish), and the puffed French toast was a favorite at our table! They also had a turkey has that wasn’t in this picture that I loved. Emmie finally started getting in on the parades at this restaurant! After we left breakfast, we spent most of the morning in the Adventureland/Frontierland area. We went to the Enchanted Tiki Room because the wait was pretty low, but none of us were super impressed…kind of boring, honestly. It’s one of those classic Disney things that you kind of “have” to do at Magic Kingdom, but don’t sweat it if you miss this one. …and then went on the Pirates of the Caribbean ride! Even if you aren’t into the movie, this was a fun one. 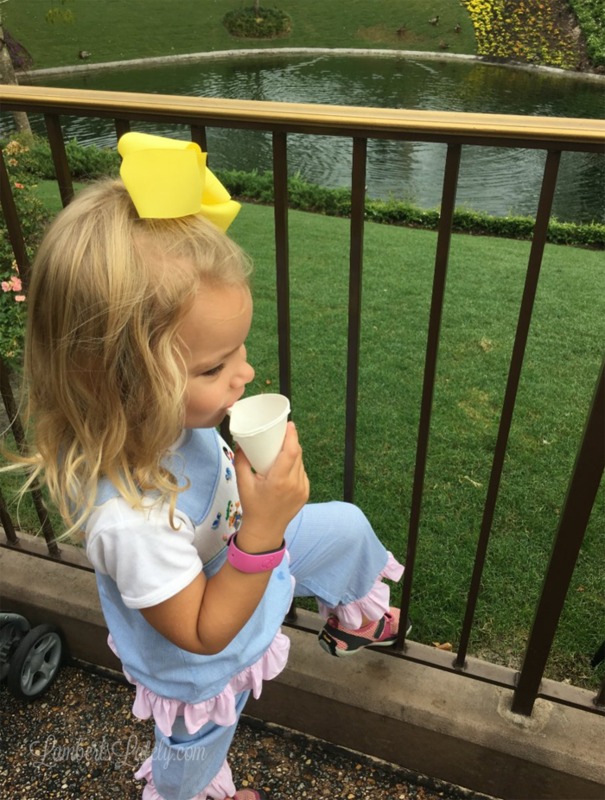 We went to the Swiss Family Robinson Treehouse next…I told Emmie it was going to be a playground, but she was kind of bummed there weren’t your traditional swings/slides. It was fun, but again, not something to sweat if you miss it. And that was my lunch that day. Not even mad about it. After our treat, we went to The Country Bear Jamboree. I didn’t know how Emmie would react to this one, but she loved it. LOVED IT. I had to take at least 10 pictures of the characters at Emmie’s request during the show. 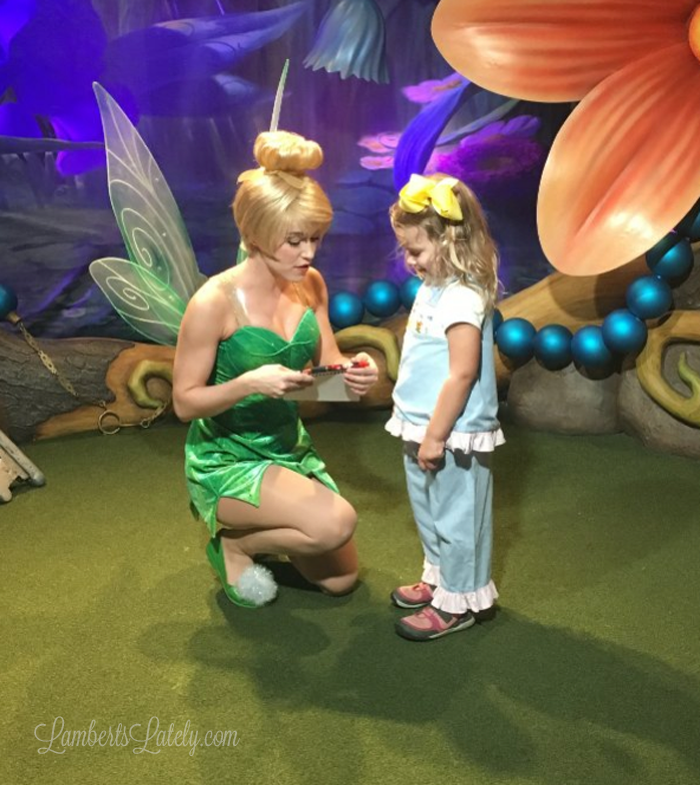 …and met Tinkerbell! She is in the building at the main entrance with Mickey, and never really had an incredibly long wait. Emmie was totally starstruck…we convinced her that she shrunk when she walked in the room with her, that’s why she was the same size. 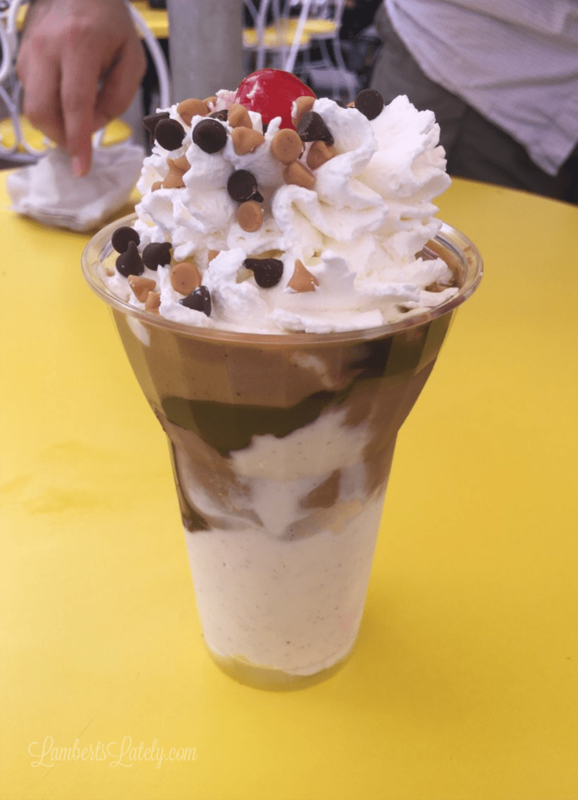 After that, we took a little bit of a break with a sundae from The Plaza Ice Cream Parlor. Definitely something you want to split – it was huge! One of the afternoon parades just happened to be going on about this point, so we sat at one of the tables outside the Ice Cream Parlor and watched. After that, we headed to Liberty Square…we had fastpasses for Jungle Cruise, but stopped for a few minutes to see another parade! Jungle Cruise is…interesting. It’s really fun and Emmie loved seeing the animals/sights, but there is a tour guide that tells the cheesiest. jokes. ever. Noah and I seriously stared at each other the whole time trying not to burst out laughing at the corniness. This was one that we liked, but I don’t get the massive waits you see for it. But this one ate it up! This was another ride where I was instructed to take at least 30 pictures. Somewhere in here, we had fastpasses for Peter Pan’s Flight and The Many Adventures of Winnie the Pooh…I apparently didn’t take pictures. We had done Winnie the Pooh the night before, so it was really nothing new…cute, but nothing special. We had seen massive wait times for Peter Pan’s Flight, so I was wondering what to expect. It’s fun, but again, I don’t get the massive waits. I did like that it made you feel like you were flying through the air, that was fun, but nothing amazing. After that, we had an appointment a Bibbiti Bobbiti Boutique! I can’t say this enough…if you have a little girl, go ahead and do this at least once. It was by far, no question, the most special, magical thing we did the whole time we were at Disney. This is a boutique for little girls (and boys – we saw one leaving with his pirate ‘do as we arrived)…for the girls, they do their hair, paint their nails, and put a little bit of makeup on. It’s really just an opportunity to pamper, and it was so much fun! I will never, ever forget that look on her face when they turned her around for the first time. She just had the best time getting all dolled up! For the package we got, you get the hair/nails/makeup and a sash…plus, you get to keep all of the polish and makeup in a cute little bag. Emmie still asks me to put makeup on her from that kit at least once a week. Something I didn’t realize when I booked this…afterwards, you get a photo session to take pictures of your child with their hair/makeup done. The pictures actually turned out really great! After we were done there, we took the monorail to Epcot for reservations at Akershus that night! I had several people recommend that we make the last night of our trip something special, so that’s just what we did with this meal, and it definitely didn’t disappoint. As soon as you arrive, you get to meet one princess (I’m not sure if it’s always the same one). Ours was Belle! As soon as we were seated, there was a princess parade. And shortly after, all of the princesses made their way to our table! At Akershus, we met Belle, Cinderella, Ariel, Aurora, Snow White, and Aurora. After they met, Cinderella sent a special collector’s pin to our table just for Emmie, since they were dressed alike! Akershus has kind of a buffet line for the appetizer, where you can get lots of different meats, cheeses, and breads. The selection was great, and I love trying different things from other countries…this was perfect for that. You order the main course off of a menu. I had the Norwegian meatballs, and Noah had the Red Wine Braised Beef (which was much better than mine)…both great though! Your dessert is family-style…they bring one big plate for everyone at the table to share. This was the rice pudding (meh), the chocolate mousse (very good, really rich) and the apple tart (also good). 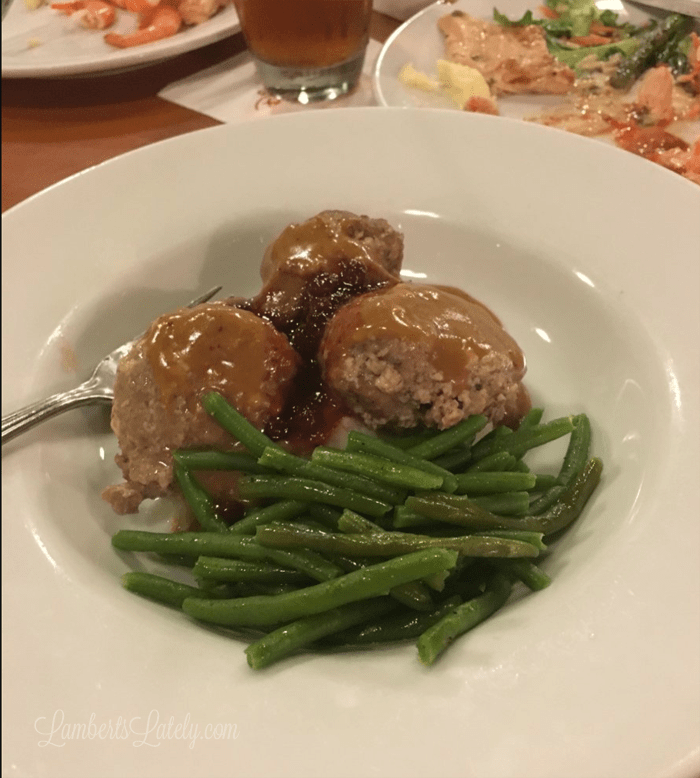 This meal can be kind of pricey if you’re paying out-of-pocket, but that’s one of the beauties of the dining plan…it doesn’t matter how much the meal costs if it’s just one table service credit! I’d say this was the best value out of all of our table services…close behind O’hana for the best meal we had. After dinner, we went to a few places in Epcot to try to use some of our leftover snack credits. We picked up School Bread and a cupcake at the bakery in Norway and a caramel apple at Karamell Kuche in Germany (where one of the nice men behind the counter was just completely amazed that there was a princess in his shop…Emmie still talks about it!). We also got a cronut at the Refreshment Port in Epcot before dinner and it was amazing…we had every intention on taking it home, but it didn’t make it to dinner. 🙂 Epcot is a great place to use up snack credits if you have a few left over on the dining plan! This girl absolutely bounced off the walls until we made it back to the room…and this is where she was about 10 seconds after hitting the pillow. 🙂 It had been a really fun but really busy day! Noah and I were glad she was asleep so quickly…it gave her some rest and us a chance to get packed up. Early the next morning, we checked out of our hotel and headed to The Contemporary for breakfast! Chef Mickey’s is another one of those classic Disney meals. It’s another standard breakfast buffet…this probably wasn’t my favorite meal as far as food, but the character interactions made it well worth it! 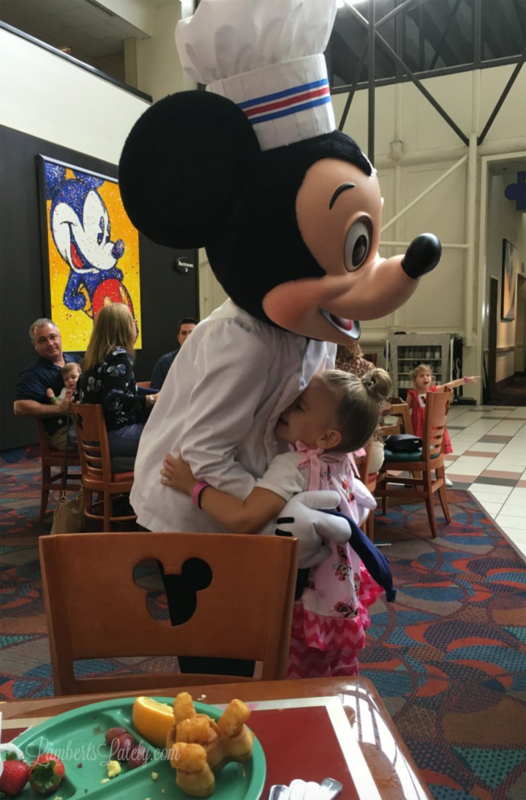 You get to meet Mickey, Minnie, Donald, and Goofy at this breakfast…and every single character was so personable and really took the time with each child. It was precious. We rode the monorail to The Magic Kingdom…if you have a chance to ride the monorail, even if your hotel isn’t on the monorail line, do it. It’s really pretty cool and Emmie had a lot of fun with it! Most of this day was our chance to re-ride things that Emmie loved. We had a few new things to do, but I really wanted her to have a chance to kind of pick her own day. Emmie and Noah rode Seven Dwarfs Mine Train as soon as we got there. Definitely, definitely get fastpasses for this one…every single time I checked, the wait for this was at least 50 minutes. It’s a little more intense than Barnstormer, but Noah said there wasn’t a huge difference, so if you need something to do and don’t want to wait in this line, try that ride! …and hopped on the People Mover. The wait for this one is rarely ever long and it’s actually kind of fun and interesting…you get to see a lot of the park! We also did The Carousel of Progress while we were in the area. I liked it, but I’m kind of a dork when it comes to seeing lifestyles from the past. I thought it was interesting. We grabbed another Pineapple Float (because, why not?). Then we headed to ride the Liberty Square Riverboat. A lot of fun if you’ve never been on a Riverboat before, and the wait isn’t long as long as you time it to be there right before the boat is leaving! After that, we did The Haunted Mansion…not a hit in Emmie’s world. She’s not big on scary rides, so this one just wasn’t for her. After that, we had reservations at Be Our Guest! This is a Quick Service Meal (at lunch) that really is like a table service. The food was excellent and the atmosphere is awesome. If you have an extra snack credit, get a bowl of the French Onion Soup as your appetizer…so good! And Noah and I both had the Braised Pork…very good. This was one I was sad I couldn’t take my leftovers home for, because they would have been awesome. Next, our family from Florida met back up with us for the afternoon! We rode the Astro Orbiter…probably the only thing we hadn’t done that we wanted to for the trip. I might be kind of a wuss, but I thought this one was sort of intense! I’m a sissy when it comes to fast rides though, so don’t take my word, but I did have to close my eyes once or twice on it. Pregnancy and fast rides do not mix for me. Of course, the thrill seekers in our group loved it! …and headed to Enchanted Tales with Belle again! Emmie was Mrs. Potts for this showing. Her cousin Avery was the beast! After that, I basically ran like a chicken with my head cut off around the park for the next hour. Tip: if you’re staying at the park the full time of your last day, don’t wait until the last minute to do your shopping. We had an hour to get like 4 things done (pretty much impossible in Magic Kingdom), so Noah and I split up…I grabbed dinner and picked up ornaments while Noah took Emmie to pick out her toy for the week and went to Starbucks (where you can use your snack credits to buy basically any drink you want…we needed it to get through the next few hours of driving!). I cannot say enough how magical Disney is. It really was one of the best weeks of our little family’s lives. It took a lot of planning and a lot of late nights/early mornings to get everything squared away, but it was so worth it! We were already talking about our next trip on the ride home. Next week, I’ll post my planning process and answers to a few questions I’ve received! If you missed them, you can see my other Disney World posts here!